At dawn Jesus was standing on the beach, but the disciples couldn't see who he was. He called out, "Fellows, have you caught any fish?" "No," they replied. Then he said, "Throw out your net on the right-hand side of the boat, and you'll get some!" So they did, and they couldn't haul in the net because there were so many fish in it. Then the disciple Jesus loved said to Peter, "It's the Lord!" When Simon Peter heard that it was the Lord, he put on his tunic (for he had stripped for work), jumped into the water, and headed to shore. When we were kids, Christmas morning meant that getting up early was fun! For the disciples, dawn was the end of a hard and discouraging night — a night of work and no fish! Dawn broke, they knew the night had been a waste, and they would go to shore empty handed, tired, and hungry. Then Jesus gave them the gift of surprise: an enormous catch of fish and a breakfast on the beach with their risen Lord, as seen a few verses later. Peter was a fisherman. Jesus had originally called Peter with a large catch of fish. Jesus called Peter to ministry again with a large catch of fish. 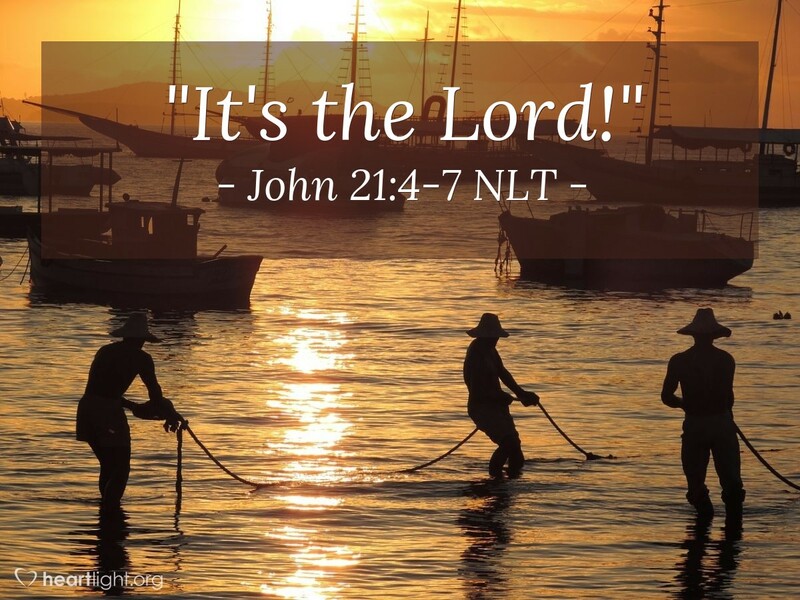 Yet most significant at this point in the story, a fisherman got a miraculously large catch of fish but left it behind as nothing for the sheer joy of being in the presence of his risen Lord. Peter left it all behind to be with Jesus! What about us? Father, I know that you want to be God of all of my life. You want me to recognize that all I have is from you and given to me by you to do your work in the world. I confess to you, dear Father, that there are some things I hold on to too tightly and don't offer to you for your work as freely as I should. Help me to surrender all that I have and all that I am to you so that you can use me to do your work in the world. In Jesus' name, I pray. Amen.